What holds the world together? Glue. Industrial adhesives are the sticky backbone of thousands of companies across a variety of industries, including woodworking, packaging, graphics arts, manufacturing, and more. Depending on what you’re trying to stick together, your choice of glue matters! While hot-melt and solvent-based adhesives are pretty popular with commercial manufacturers, water-based glues can offer the same or higher quality results depending on your project. Let’s take a closer look at the benefits and best practices for when to use water-based adhesives. What is a Water-based Adhesive? What Types of Applications are Liquid Glues Used For? Due to its versatility, water-based glues have many uses in manufacturing. Often, liquid glue is used for creating packaging, case and carton sealing, laminating, rigid box manufacturing, wood bonding, bookbinding, graphic arts, food and beverage packaging, and general assembly applications. Let’s touch on the three most popular types of liquid glue, resin, dextrin, and starch adhesives and how they meet the varying needs of manufacturers. Known for its extreme durability and climate resistance, resin glue is popular for joining heavy-duty materials. Once applied to a surface, resin quickly forms a tight, strong bond. Usually, the primary components of resin water-based adhesives are: ethylene vinyl acetate (EVA), polyvinyl acetate (PVA), and acrylic resin emulsion polymers. To develop resin water-based adhesives, the water is mixed with the PVA and EVA to create a liquid mixture that dries clear. Why Choose Resin Glues for Your Project? You should always follow the manufacturer’s instructions and safety precautions before starting to work on your project. When using resin glue, it’s important to operate in a clean, well-ventilated area. You should also strongly consider wearing rubber gloves, eye protection, and a respirator. Before you start your project, cover your workspace in wax paper, as resin will not stick to wax, or use tarp to keep your area clean. A level surface for drying should already be prepared. Don’t forget to keep extra boxes or domes to cover your resin project while it cures to keep out dust and contaminants! Dextrin glues, also known as vegetable glues, might not have the flexibility of a resin glue, but are able to dry flat. Due to its ability to resist curling, dextrin glues are perfect for packaging, bookbinding, attaching labels, stamps, paper pages and more. Dextrin glue bonds well to paper surfaces and is resistant to both hot and cold temperatures, but the vegetable base does make this glue more susceptible to releasing when exposed to water. Why Choose Dextrin Glues for Your Project? Dextrin glues require little cleanup and can be left overnight without crystallizing if covered with a wet towel or placed in a plastic bag to prevent contact with air. The glue can also be reclaimed. Dextrin glue is generally ready to use right out of the tube and requires no mixing or dilution. The no ‘daily clean up’ aspect of dextrin adhesive makes it very economical for manufacturers. Starch glues are made from natural resources, such as natural carbohydrates collected from roots, rubes, and plant seeds. In fact, starch glues are manufactured from similar ingredients found in dextrin glues, but are made from cooked starch powder rather than formed through the hydrolysis of starch. Why Choose Starch Glues for Your Project? 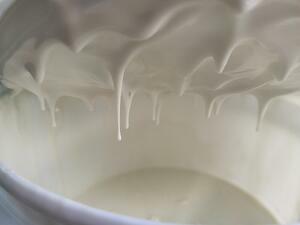 Liquid starch glue is developed from white starch powder that has been dissolved in water at 180-190°F. Due to its high viscosity and long open time, starch glues can be heated or applied at ambient conditions and are suited for working with paper products. Starch glues are easy to clean up and can be formulated to meet user requirements if extremely high viscosity is needed. Many industries rely on both water-based and solvent-based glues to get the job done! The construction industry is a great example, as many applications using PVC or plastic will require a solvent-based adhesive. Laying tile or wood flooring, however, is a job for water-based adhesives. Remember, water-based glues are usually used for paper-to-paper applications, including manufacturing envelopes, labels, and packaging. Water-based adhesives are also useful when working with wood, fabrics, or laminate bonding. 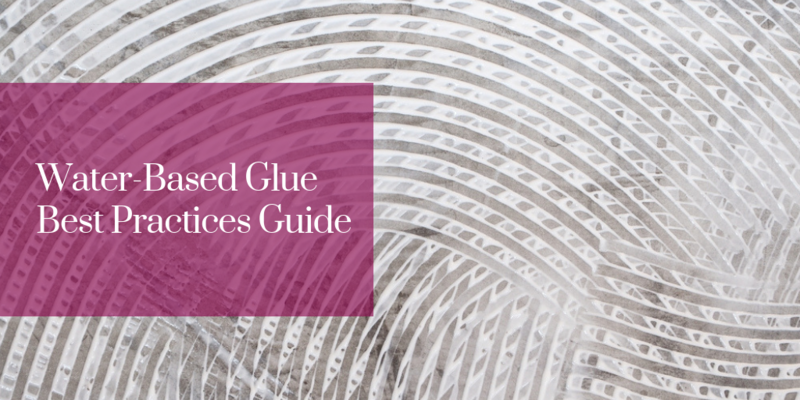 Liquid glue works best on projects that require high-tension surfaces and when at least one of the substrates is permeable during application. The wide range of surfaces water-based adhesives adheres to make it extremely popular and economical to work with. They also remain stable in humid environments and across a wide temperature range. Water-based glues can be dispensed by spraying or rolling. However, liquid glue adhesives are not very water resistant and tend to be soluble, so they shouldn’t be used in wet environments. Hot melt glues have a faster drying time than water-based glues, and tend offer a more flexible hold than other glues. 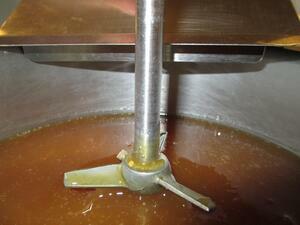 Hot melt adhesives are quick, efficient, and work with a wide variety of surfaces. Typical hot melts are generally limited to EVA, polyamides, and APAO. 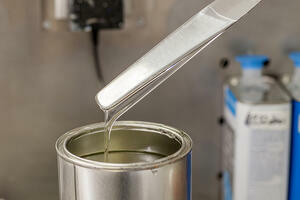 Most hot melt glues have a limited open time and require precision to work with. Interested in Using Water-Based Glues in Your Manufacturing Process? If you are considering using water-based glue in your next commercial project or wondering how water-based adhesives can improve your current manufacturing process, contact the adhesive experts at LD Davis.